An analysis to evaluate the effectiveness, economy and accountability of merging the Washington State Board of Accountancy into the Washington State Department of Licensing found such a merger would “result in a significant decrease in the accountability of the Board to the public and the profession” with “little or no gain in efficacy or economy of the Board’s operations and functions.” The report was submitted to the Board, the Governor and appropriate state appointments on November 30 by Zwillinger Greek Zwililnger & Knecht, PC, a Phoenix, AZ, firm. The “Merger Report” resulted from an amendment to section 144 of the State of Washington’s Supplemental Budget for fiscal year 2010/2011 which allocated funds to allow the Accountancy Board to engage a consultant to conduct an independent investigation and produce this report. It was coupled with a Performance Review Project Report that studied the practices, policies and procedures of the Board and concluded it was properly run. 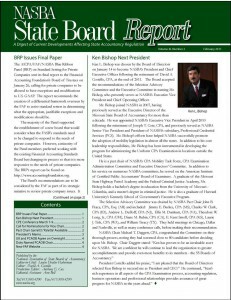 The Washington Society of CPAs, NASBA Committee on State Board Relevance and Effectiveness, and the U.S. Department of the Treasury’s Advisory Committee on the Auditing Profession were all quoted in the report as endorsing the independence of State Boards of Accountancy. The consultants’ evaluation looked for evidence that would support or contradict those positions by: 1? Obtaining and comparing information related to complaints investigated by Boards of Accountancy that are independent agencies versus those operating under the authority of other governmental agencies; 2? Comparing investigator resources per licensed individual of the Board versus the various disciplinary boards under the Department of Licensing’s authority; 3? Comparing complaints investigated per licensed individual by the Board versus under the various disciplinary boards under the Department’s authority; 4? Considering the impact that consolidation of the Board with the Department would have on the Board’s access to the State of Washington’s Governor’s Office. Based on responses from 22 Boards of Accountancy, the consultants observed: “Independent agency accountancy boards averaged 26.17 complaint investigations and resolutions per 1,000 licensees over a two year period (or 13.08 per 1,000 licensees for a one year period) and consolidated agency accountancy boards averaged 14.15 complaint investigations and resolutions per 1,000 licensees over a two year period (or 7.08 per 1,000 licensees for a one year period).” When the consultants looked only at medium?sized boards with 10,000? 20,000 licensees, they found four independent boards averaged 24.24 complaint investigations and resolutions per 1,000 licensees over a two year period, and four consolidated agency accountancy boards averaged 11.70 in the same period. As the proposed merger would not change the number of the Board’s investigative staff, the consultants said that provided no reason in favor or against merger of the Board into the Department. They looked at the number of cases resolved and investigated by the Washington Engineers/Land Surveyors Board which is under the authority of the Department, and found their rate of investigation and resolution was 56 percent lower than the Accountancy Board’s. Having constructed a pro forma expenditure budget, the consultants found there would be an annual savings of $63,200, or 5.4 percent, if the Board were to be merged with the Department. However, they felt this was a “negligible savings” which was not enough to conclude the merger should take place. The consultant’s comparative operational benchmarks for average expenditure per full time employee did not support a conclusion that the merger should take place. Currently the Washington Board has a Web site that includes on?line license applications, online license renewals and on?line search of the status of a licensee. To convert or integrate the Board’s IT with the Department’s would cost from $200,000 – $500,000 or more, the consultants estimated. “Depending on the ultimate costs of implementing the IT systems’ integration and conversion, and the accuracy of our pro forma expenditure budget savings of $63,200 upon merger, it would take the State of Washington three to eight years to recover the actual costs of merging” the Board’s IT platforms and databases.